Like an Old Fashioned Waltz / ? Again, there are quite a lot of versions of the eponymous title song of Sandy's third post-Fairport solo album. It is very 30's influenced (as are several of the songs on the album). Naturally the song is in 3/4 time and the orchestral violins begin to play on the line “And violins play from behind garden walls”. The tune features a modulation for the instrumental break, then reverts to its original key when Sandy resumes singing. 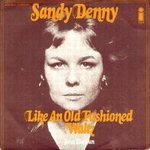 The studio version was of course released on Sandy's album Like an Old Fashioned Waltz . It was later included in the Sandy Denny anthologies No More Sad Refrains and A Boxful of Treasures . An alternate take without the added string section can be found on the cassette Together Again - The Attic Tracks Vol. 4 . A solo live studio recording from September 11, 1973 for the BBC Radio 1 show “Sounds of the Seventies”, hosted by John Peel, was broadcast on September 25, 1973. It was first published in 1997 on The BBC Sessions 1971-73 and later in 2007 on the 3CD+DVD set Live at the BBC . After Sandy rejoined Fairport Convention in 1974, a live recording was made at the LA Troubadour and released on the semi-bootleg From Past Archives and in 2005 as bonus track of the CD reissue of Like an Old Fashioned Waltz . Another Fairport live recording from May 1974 at Ebbets Field, Denver, Colorado was released in 2002 on the bonus CD of Before the Moon . The DVD Sandy Denny: Under Review has a short video footage of Like an Old Fashioned Waltz from a Fairport Convention gig at Birmingham University in 1974. This is very murky, both in sound and vision. Another performance from the same gig, of Solo, shown on the Fairport Convention video It All Comes 'Round Again , was for a long time the only known video of Sandy Denny.